I love to fix salmon, but I really don't do it often enough and it is so easy! I can remember when I was intimidated cooking fish of any kind, but after preparing it, it seemed so easy. And it is! Now, I have several "favorite" ways to do salmon, so this is just one way. And it is delicious with the honey mustard glaze. This can be done under the broiler, in the oven or on the grill. It only takes minutes and your dinner is ready! First, let me tell you that I can only buy wild salmon frozen in the 1 pound bags, so this is not fresh caught. But it's still extremely good! I thaw out the fish in the bag in the fridge. Then, it needs to be dried off with paper towels. I place salmon in a dish and pour about half of the honey mustard glaze over it. Then, preheat the broiler and place rack under it. With this glaze you have to watch that it doesn't burn, so I have had to move the salmon onto a lower rack to prevent it from becoming a burnt sacrifice! If that makes you nervous, you can bake the salmon instead in a 400 degree oven. Let's begin. Mix the first four ingredients together. Lay salmon in a pan, add a little salt and pepper, and pour half of glaze over it. Preheat broiler or oven. when ready to cook, place salmon on low rimmed baking sheet and place under broiler. Watch closely so it doesn't burn. 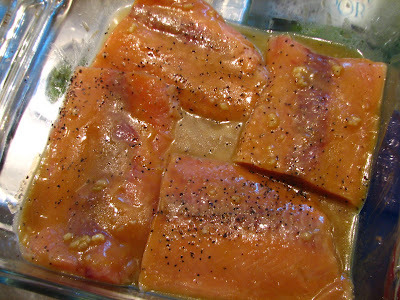 Brush salmon with honey- mustard glaze several times while cooking. It will be done in about 6-10 minutes, depending in thickness and size of salmon. To test for doneness, insert a fork into the thickest part of the fish and turn slightly. If it flakes easily, it is done. Remember, if the fish gets too brown, or the pan begins to burn, remove fish to a lower rack in your oven. When done , remove salmon from oven and serve! It's a quick and easy main course, fit for company or your family. I served it with fresh green beans and brown rice. The glaze is so good that you must be sure to get plenty on the fish! I also add more pepper if too much gets brushed off when applying more glaze. This is a wonderful tasting salmon that I will continue to make over and over again! Do you have a favorite way to prepare salmon? This is great! I think a lot of people are a little initimidated by fish, but you've shown that it doesn't have to be scary. I'm sending this to my brother as he eats fish at least a couple times a week. He'll certainly enjoy this! I love salmon but I don't cook it nearly often enough. This looks like a great way to eat it, the glaze sounds delicious. You do such great fish! I can't wait to try it. Thanks for the comment about the babies... I can't wait to go back east!! After "her" mom has left. Not that we couldnt' have gone together, but we are more help for longer if we go alone. The babies are doing well. I love salmon, especially with a mustard glaze/sauce. It just makes it so delicious. This salmon looks delicious, I especially love the glaze. Looking forward to trying this recipe. Just stumbled across your blog and quite a few of your recipes have caught my eye! I'm always looking for new salmon recipes...this looks great! 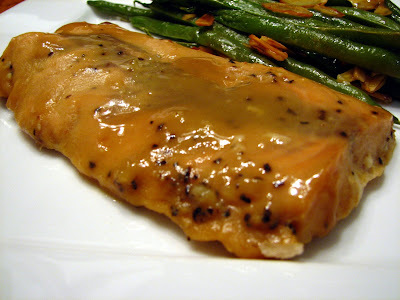 I've made similar honey mustard marinades for chicken but never salmon - what kind of side dish did you serve with this? Looks great! I love salmon and this recipe looks wonderful! Be still my heart! Your glaze is amazing. I love salmon and don't prepare it often enough, but I have to try this glaze! Hi, Maris, thanks for stopping by! 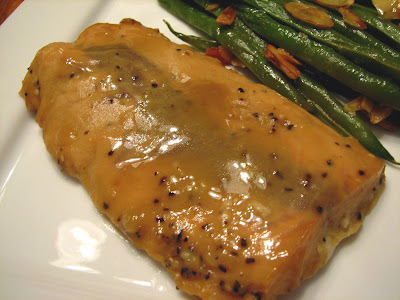 I served this salmon with brown rice and Green Beans Almondine( next post).It was a great meal! I've used a honey mustard glaze on ham before, but never salmon. I can't think why, I'm sure it would be as good as you say. Thanks for the inspiration. That looks so delicious, Lynda! Can't wait to try it!